This paper provides an overview of oil industry developments in the Western Hemisphere with particular emphasis on Latin America since the inauguration of the Enterprise for the Americas Initiative by George Bush. I discuss thesedevelopments in the context of the Canada-U.S. Free Trade Agreement (concluded in 1989), and the negotiation in 1992 of the North American Free Trade Agreement (NAFTA). This paper is concerned essentially with the oil industry and does not discuss the importance of natural gas for Canadian producers nor the fact that much of Latin American oil production (notably in Mexico) is associated with natural gas. I examine the shift to trade and investment liberalization and privatization in the 1980s and early 1990s, especially in Latin America-where the most dramatic transformation has occurred. I suggest that investment patterns in the industry have been only marginally related to trade liberalization, and have derived more from considerations of resource availability, exploration and development costs, market factors, and the general state of the international economy-all of which have contributed in the 1980s to significant restructuring and downsizing among a number of major corporations. I also note the important increase in an internal Latin American market, and the role of regional organizations such as ARPEL-the Association of Latin American State Oil Company Producers. EJ - How Might North American Oil and Gas Markets Have Performed with a Free Trade Agreement in 1970? 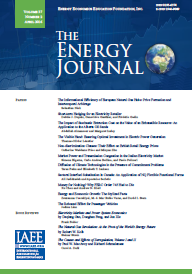 Published in Volume14, Number 3 of The Quarterly Journal of the IAEE's Energy Economics Education Foundation.